It was one of those rotten days. I’d had a bad day at work, I was mad at someone in authority over me, and my clothes were soaked with freezing rain as my husband and I patched the tire on the car. By the time we finished, we were late delivering a now-cold casserole to a couple whose newborn baby we rejoiced over, but whose sweetness increased the ache in my still-empty arms. So yeah, I groused a bit. Something about that cranky day imprinted on my memory. After I dropped off the soggy casserole, my seminary neighbor took one look at my scowl and suggested I refocus on Jesus, maybe read something on the lives of Christians who’d gone before me. That was the first time I’d ever read Christian biographies. I admired these brothers and sisters in Christ, but truthfully, I also felt I’d never be like them. I lacked their talents, faith, and deeds. If we were all flowers in God’s garden, I felt that these biography-worthy folks were long-stem roses, and I was a scraggly weed-blossom with no exceptional characteristics at all. But something sprouted in my heart when a friend loaned me a biography of Thérèse of Lisieux. I had nothing in common with Thérèse, really. She was born in France in 1873, entered a Carmelite convent at fifteen, and died nine years later of tuberculosis. Her life was short, sheltered, and uncomplicated by punctured tires, marriage, and bad work-days. Her life was, however, exactly like mine in the most important ways. She loved God. She wanted to give Him her all. She struggled to serve Him in the midst of broken and frustrating circumstances, living among broken and frustrating people. “I have no other means of proving my love for you [God],” she wrote, “than that of strewing flowers, that is, not allowing one little sacrifice to escape, not one look, one word, profiting by all the smallest things and doing them through love” (Story of a Soul, 196). Thérèse did ordinary things with extraordinary love. She referred to this path as her “little way,” using even the smallest of behaviors and attitudes to show God devotion in the everyday activities of life, "...to cast before Jesus the flowers of little sacrifices" (Storm of Glory, 171). Sometimes our opportunities are obvious and easy. Just as Thérèse performed her tasks in the sacristy or linen room to God’s glory, I can also honor Him while I’m preparing meals, chauffeuring kids, or plotting a novel as I keep God at the center of my choices, thoughts, and trust each moment. Sometimes little acts of love require sacrifice. Perhaps, like me, you’ve had a rotten day. Or maybe even a rotten year. Maybe there’s a person in your life who has hurt you, demeaned you, or just drives you nuts. Thérèse had all those sorts of people in her life, too. Instead of dodging them or complaining, as I’m tempted to do, she sought them out and showed them attention. Her kindness was not an act. She wasn’t phony, smiling at them while thinking how much she would rather be anywhere else. She yearned to please Jesus, and saw honoring His children as part of it. One of my favorite anecdotes refers to a nun whose throat-clearing habit made Thérèse’s skin crawl, but Thérèse prayed to love the noise so she could better love the nun. This “little, nameless, unremembered” act might seem miniscule in its importance, but I can relate to it, and it makes me aware of my own tendencies and choices. I can change the look on my face when someone’s interrupted me, or soften the tone of my voice when I’m exasperated. The minutest of acts can be tokens of our affection for Jesus if done with love. Biographer John Beevers describes Thérèse’s "flowers of little sacrifices," or seemingly insignificant acts of devotion, this way: “They seem simple to do or not do; but although simple, they are in reality not easy. They are, though, possible. It is not given to many men or women to achieve martyrdom, to enjoy the excitement and endure the loneliness of the mission-field … but everyone can destroy his pride and kill his self-love; everyone, however lowly his position, however limited his sphere of action, however small his talents, can love God and his neighbor and manifest this love by a unflinching persistence in performing the ‘little, nameless unremembered acts of kindness and of love.’ Thérèse is the saint of the possible” (Storm of Glory, 112). After her death, the writings were given to other Carmelites for use as the requested obituary. Since then, Story of a Soul has inspired millions, including a teenager named Agnes Bojaxhiu, who was so moved that she decided to change her name. We know her as Mother Teresa, a woman who indisputably seized each moment to show extraordinary love. Whether you feel you’re a wildflower or a long-stem rose in God’s garden (and I’ve since learned that to God, we are all extraordinarily gorgeous flowers), your life is made up of moments. How we respond to our circumstances in those moments reveals our hearts. An action does not have to be mighty to be a token of love to the Lord. I pray you’re blessed as you offer extraordinary love in a phone call, word, or smile today. Question for the Day: Thérèse loved flowers: their rich scents, vibrant hues, and soft textures. What’s your favorite flower? Why? PS - I wish I could have fit more of Saint Thérèse's words here, as I find them truly inspirational, but I rambled on enough as it was. If you'd like to read just a few of my favorite quotes (including the throat-clearing story, to which I can thoroughly relate), check out my blog post for today on Tea and a Good Book, http://www.susannedietze.blogspot.com/. Photos of St. Thérèse are in public domain. Beautiful. Thank you Susanne, and it fit so well with yesterday's post. As I was reading I was actually thinking about how much I love wildflowers. In my first novel, I use wildflowers a lot to represent God's glory in creation, especially cornflowers, poppies, buttercups, and foxgloves. I chose those because they were true to the area and created a riotous rainbow of color. Then that reminded me of a section in The Shack, where the Holy Spirit is explaining that sometimes from up close we would look at such a garden and see a mess, but as you move further away you can see God's beautiful plan and design. Oh, how I loved this post! I could imagine St. Therese working in her garden, amid buzzing bees and swoon-worthy scents! I copied a snippet of this post to send to my friend Cammie, who has adopted “I have no other means of proving my love for you [God],” she wrote, “than that of strewing flowers, that is, not allowing one little sacrifice to escape, not one look, one word, profiting by all the smallest things and doing them through love” (Story of a Soul, 196), as her personal creed. My favorite flower? Wow! That's like picking my favorite book! Calla lillies, for their elegance and their commanding lily fragrance. Each of my novels highlights a flower. Wow! I actually read a novel once that made several references to St. Therese, but never told her story. I guess the author expected us to know! But now I understand the references so much better that it enhances my memory of the story! But on a more personal note, a great reminder of the little things that matter and which are so often disdained in our society today. I have a brown thumb, but my favorite flower is a gardenia, for the smell and the pure whiteness of it. But for a practical flower, I love this flowering bush thing in my backyard (can't remember the name!) that always looks like dead sticks in the summer but blooms to beautiful yellow flowers in the fall! I love hydrangea, the delicacy of the individual blossoms and the full bodied loveliness of the whole bloom. The delicate scent, and the certain knowledge that it must be warm out! Thanks, Susanne for this post about St Therese. I have to admit I knew nothing about her until I was trying to find pictures for the header. I love the sweet gentleness that seemed to have surrounded her. I think it was Patti who mentioned carrying our spirituality with us like a perfume, and St Therese was one who had an especially beautiful aroma. Good morning! I've put on a pot of tea for us. What gorgeous flowers you all love. I have a hard time deciding which flower I like best, and I like each variety mentioned so far. I have a special fondness for morning glories too, Lori. I planted some at my previous house and they really do seem to sing, "good morning! It's sunny!" I have fake hydrangeas in the house; I cannot grow them well. I wish I could. A friend of mine had huge bushes of them and I always felt like I was in a fairytale cottage among her gorgeous hydrangeas. But, I'd have to say that roses always cheer me, because they remind me of my mom, they come in so many varieties, and they smell so good. And I actually know how to take care of a rosebush, sort of. I have a brown thumb too. Patti, you crack me up. What flower could Reclaiming Lily possibly feature? Hmm. Sounds like you, Dina and I have a thing for flower metaphors. My WIPS are named after wildflowers (Lady's Slipper, White Heather, and First Snowdrop). I'll be back after the school run. Have a good morning! Yes, my first historical is Dance of the Dandelion and right now the working title of the second is Lily of the Valley, which surprisingly, hasn't been overused in fiction. I wanted to call it Lady's Lace (also known as Queen Anne's Lace), but the name didn't exist at the time, and the names they would have used for the flower at the time like bee's nest or wild carrot didn't sound romantic. Sigh. 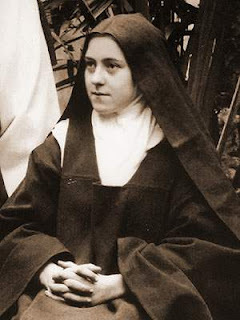 Thérèse of Lisieux must have exuded extraordinary patience. A character flaw I sometimes wish I had more of especially when it comes to my family. But I'm still trying. My favorite flower is the pansy. I sometimes see faces in the tri-colored pansies. Anyone else ever had that experience? I remember something about pansies beginning in england when I was researching for a novel. Pansies are so delicate, yet they can grown in the winter in England and I love the colors and variations. I'd not heard of St. Therese. Her relationship with God reminds me of Brother Lawrence (Practicing His Presence) the way she just offered every action and thought to God as worship. Sometimes I think we've made our worship so complicated, when it's supposed to be childlike faith. Thanks! A blessing as always! Oh Dina, Lady's Lace is a lovely title. What a bummer that they called it something else then. Wild Carrot doesn't quite have the same feel, eh? LOL. I love Lily of the Valley for your title: such gorgeous flowers, with Biblical connotations and everything. Jill, I see faces in pansies. I think they're such cheerful, sweet flowers. I didn't know that they grow in winter! I was here early and still can't think of my favorite flower. For color, Blue Mirror Delphinium - a darker shade of that amazing morning glory blue. For shape - balloon flower, for fragrance mexican hyssop. For joy - my red and purple tulips heralding spring! Loved the post Susie. I learned so much about Therese. I would want to be like her if I could but I'm working on trying to be the better version of me. That's hard enough. Amazing what God could do with me if I let go, eh? Nice to meet you all for tea this morning . . . well, it's after lunch and I've made some chamomile. BTW my series is about flowers too, more famously known for their herbal uses. And not always for the good! Nightshade, Wolfbane, Baneberry. Glad you ladies are keeping it a little lighter! what a wonderful tribute to st therese of lisieux. she, too, is an inspiration to me. my favourite flower is the tulip...i love it's simplicity. always enjoy visiting your site. Thank you for sharing St. Terese with me - she has become an incredible inspiration to me! I am particularly reminded today of her desire to just love Jesus. May we all fall so in love with Him! Deb, I love your quote, "trying to be the better version of me." Awesome! I don't think I know what mexican hyssop smells like... you'll have to describe it to me. For scent, I love orange blossoms and jasmine. Oh, tulips are lovely, Karen. Which reminds me, I have some bulbs I need to get into the ground. Tulips are so cheery to me, and we plant some every year. Thanks for stopping by! I'm honored to hear that you thought my post honored her. Thanks, and I'm glad to know she's inspired you, too. And I'm delighted to see you, Karl! I hope your day is going well! Thanks for visiting! An inspiring tribute! And a loving reminder that to God it isn't so much what we do, but our attitude as we do it. I often don't realize how empty I feel until I come to Inkwell and read each day's entry. I always come away feeling refreshed, like God has whispered in my ear. Thanks, Wenda. What a beautiful statement: God has whispered in your ear. I, too, feel blessed and refreshed after reading what's up on Inkwell. I loved your post, Susanne. Very beautiful imagery, and a lovely story I hadn't heard before. I did not grow up in a Catholic church, but I've always, always had a fascination with nuns and the lifestyle they live. Amazing. My favorite flowers are daffodils. They're like beautiful fields of sunshine. Unfortunately, I'm allergic, so I can't have them in my house. Thanks, Suzie! I am not Catholic either, and I had no clue who Therese was until my friend loaned me the biography. I love daffodils, too: heralds of spring. That's too bad you're allergic. I can't have lilies in the house without being affected, though they smell wonderful. These posts are so wonderful! Thank you. I do love the little faces of pansies but my favorite flowers are African violets because they grow so well for me and they remind me of my mother! Hi Martha! I envy your violet abilities. I've never been able to help them thrive. I'm one of those people who doesn't kill flowers, exactly. But other than my monster basil plant which is still going strong, I don't have a knack. When I was a teenager, I house sat for a lady who had several violets, and she was serious about them. The checklist she gave me for taking care of them was lengthy...and I still flopped.